Also, Enjoy this beautiful blog created by one of our pilgrims documenting each day of the trip. 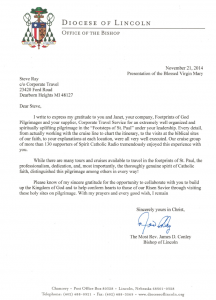 I write to express my gratitude to you and Janet, your company, Footprints of God Pilgrimages and your supplier, Corporate Travel Service for an extremely well organized and spiritually uplifting pilgrimage in the Footsteps of St. Paul under your leadership. Every detail, from actually working with the cruise line to chart the itinerary, to the visits at the biblical sites of our faith, to your explanations at each location, were all very well executed. 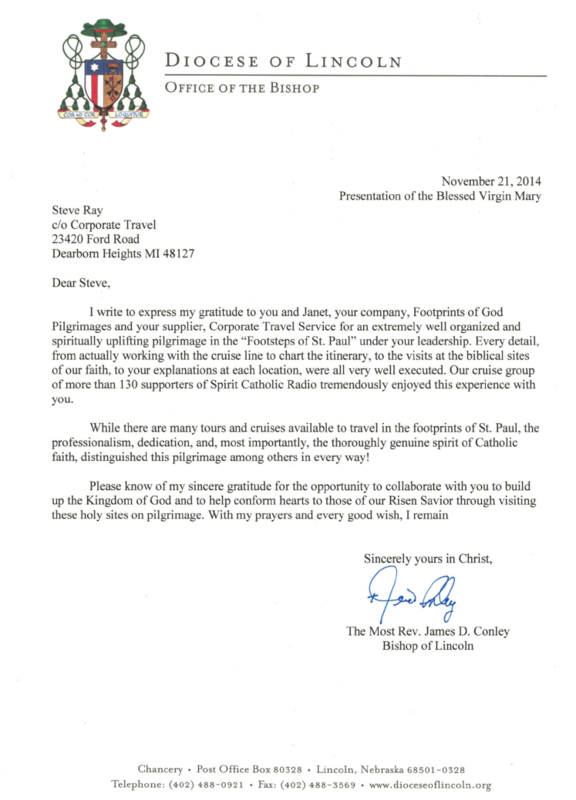 Our cruise group of more than 130 supporters of Spirit Catholic Radio tremendously enjoyed this experience with you. While there are many tours and cruises available to travel in the footprints of St. Paul, the professionalism, dedication, and, most importantly, the thoroughly genuine spirit of Catholic faith, distinguished this pilgrimage among others in every way! Please know of my sincere gratitude for the opportunity to collaborate with you to build up the Kingdom of God and to help conform hearts to those of our Risen Savior through visiting these holy sites on pilgrimage. We started with the drive through Rome to the Pantheon where we left everybody to scatter for lunch at all the excellent and delicious cafés in the area. We came back to the hotel for dinner where we met a real Swiss guard who shared some of his life with us. We also met John Hale who is the president of Corporate Travel and organizes all of our trips. After that, everyone crashed into bed ready for Mass tomorrow at the tomb of St. John Paul II in St. Peter’s Basilica. Today was a blockbuster day following St. Paul as he entered Europe for the first time. Kavala, the city on the coast of the Aegean Sea used to be called Neapolis during Paul’s time. We arrived and boarded our buses and drove through Kavala seeing the mosaic of Paul receiving a vision from the Macedonian man who begged him to come across the seas and bring the good news to Macedonia and Greece. Our boat was docked in the same place Paul’s was 2000 years ago and we drove to Philippi and we relived Paul’s visit there. We saw the prison where Paul and Silas were kept and I gave my talk “What must I do to be saved?” In the ancient Roman theater. We also walked on the old Roman Road between Kavala and Philippi. It was a highlight for people as they walked on the same stone road that Paul walk done with the sandals. Tonight was formal night in the dining hall and everyone dressed up in their finest and had a very elegant meal. After that many gathered to pray the rosary and to meditate and discuss on the sites that we saw today. Enjoy the movie! Istanbul, or rather for Christians – Constantinople is where we toured today. We started at the gym of the city called Hagia Sophia. This magnificent edifice was the most beautiful and largest church in the world for 1000 years before St. Peter’s was built in Rome. The Muslims took it over and defaced all the Christian art and turned it into a mosque. It is now a museum. It is a little depressing and heartbreaking to walk through this beautiful building and think of what it was like in its glory days when people entered it and thought they had just arrived at heaven. No wonder the pagans rushed to join the church to be part of this glorious people of God. Next we visited the Church of Irene which means in Greek the Church of Divine Peace. This is the oldest church in Constantinople built by Emperor Constantine and it was never turned into a mosque although today it is a museum. This was the church where the 2nd Ecumenical Council of the church took place. We also visited the exotic Spice Market and had Mass at the Cathedral of Istanbul called the Church of the Holy Spirit. Lunch was at the Hamdi restaurant which served a wide selection of traditional Turkish foods. Everyone loved it. Enjoy the movie! What a day! We had a wonderful Mass on the ship with Bishop Conley presiding. Then we took off in our buses to go to Pergamum the biblical city mentioned in Revelation 2:12-17. We also had a marvelous talk by Fr. Scott Courtney on studying and loving the Word of God. Everybody was laughing and cheering. It was a great day and we hope you enjoy the two videos. Tomorrow we head for Ephesus and Mass at Mary’s House. Great day in the city of St. Paul, St. John and where Mary lived. Also the 3rd Ecumenical Council where bishops declared Mary the Mother of God. Also Bishop Conley’s excellent homily during Mass at Mary’s House at Ephesus. Off the ship and in to tour Athens. First we had Mass at the Catholic Cathedral of St. Dionysius the Areopagite who was Paul’s convert in Athens who later became Athen’s first bishop. Our favorite stop was Mars Hill, the Areopagus, where St. Paul explained the truth of Jesus Christ. To the judges of Athens. I gave my short talk on Paul, evangelization and sharing the truth in a way the current culture can understand. I read the Bible passage about Paul’s visit and preaching. Up the Acropolis, study the Parthenon and the goddess Athena. Lunch in cafes along the Platka. Checked into the Metropolitan Hotel. At the hotel I gave one of my favorite talks: Swimming Upstream: Living the Catholic Life in a New Pagan Culture. Thunderstorms were forecast but the rain stopped when we arrived in Ancient Corinth. Blue sky broke thru and we had a moving Mass on a rock outdoors in front of the Judgment Seat where Paul was brought. Everyone contributed to buy a magnificent gift for Bishop Conley. Watch to see what it was as he describes it. Back to the hotel for a Saturday evening Mass, dinner, an early night and off to the airport and home. Everyone left happy and thankful. It was a great and spiritually profound pilgrimage. It is always hard to say goodbye after spending two weeks together visiting all the biblical sites in the footprints of St. Paul, St. John and Mary. It was a wonderful trip and here are a lot of comments and thoughts of the people who joined this pilgrimage including Bishop Conley of Lincoln Nebraska and all the priests who joined us. Everyone is now on a plane heading for home but with this video you can share the warm glow of our final moments.